ReTreat specializes in artisanal gelato, sorbet, and confections crafted from all-natural, gluten-free ingredients. The company is located on the British Virgin Island of Tortola and is essentially a paradise all on its own, so we proposed both the brand name (ReTreat) and logo reflective of "paradise." The typography is relaxed and loose, as one ideally feels on vacation. The crossbars of the two letter "t"s connect, suggestive of a hammock hanging between two ever-so-subtle palm trees. A key value of the ReTreat brand is the company’s use of high-quality, seasonal ingredients local to the island of Tortola and the Caribbean at large. Thus, the use of a paper stock with a natural texture was essential to the character of the brand. While the textured matte of the paper stock allows us to communicate ReTreat's all-natural and authentic brand attributes, we didn’t want the logo to take second stage; therefore, the glossy, black raised ink helps the logo pop on the card in contrast to the paper stock. The ReTreat® brand is located on the British Virgin Island of Tortola and is essentially a paradise all on its own, surrounded by water, so the glossy raised ink subtly evokes the reflective and glistening nature of the sea. Made with locally sourced, simple ingredients and always dairy-free, ReTreat® Picked&Peeled® sorbet is the perfect bowl-mate for every spoon. Available flavors include mango, papaya, and soursop. 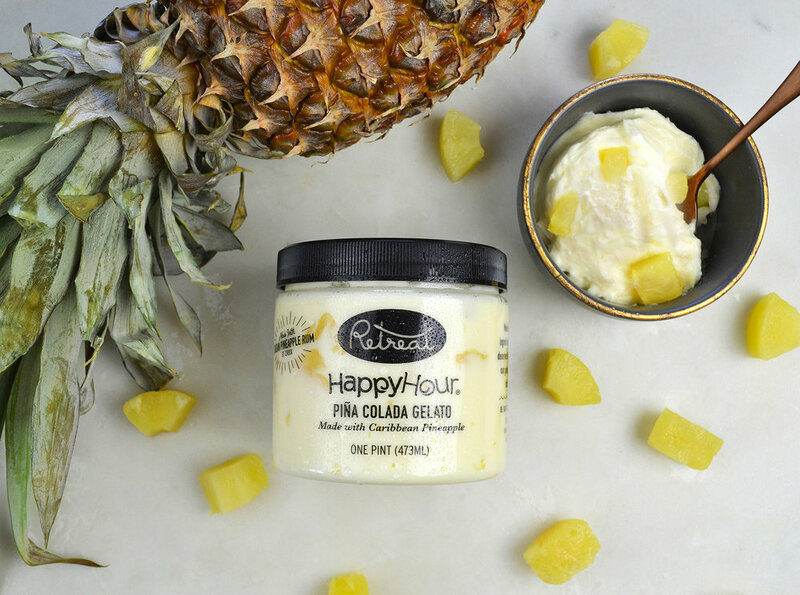 Made with locally sourced, simple ingredients and infused with island-made rum, ReTreat® Happy Hour® gelato deserves the top shelf. Smooth and spirited, our gelato is sure to get your taste buds tickled and tipsy. ReTreat® Island Inspired® gelato is paradise ina pint. Bold, exotic, all-natural, and locally sourced, our gelato will make any spoon swoon. Flavors include toasted coconut almond fudge, fresh mint chip and more!